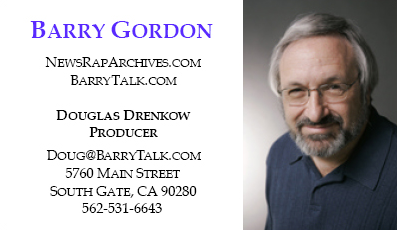 As associate producer of various talk shows executive-produced and hosted by Barry Gordon, longest-serving president of the Screen Actors Guild, I designed various items visually promoting his brand, using the headshot and logo he had commissioned. All items on this page © 2008 Barry Gordon. All rights reserved. The merchandise — caps, clothes, mugs, mouse pads, etc. — was available through the host’s Web site and online store, both of which I created. 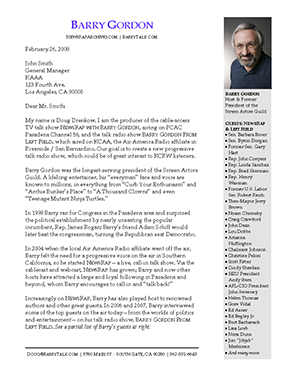 In 2008, I created and mounted this large (3 feet by 4 feet) “newsroom” type graphic (at 300 dpi) for episodes of NewsRap, the cable TV talk show hosted and executive-produced by Barry Gordon, the longest-serving president of the Screen Actors Guild. I was associate producer for several episodes. See also my consulting on the design of a TV backdrop for the Governor of Washington State. I created the banner ad, targeted to a progressive political market, within the strict limitations imposed by the Liberal Blog Advertising Network, and then posted it on two of their member blogs: The published ad (pictured atop) is a GIF file, just 150 by 100 pixels and 4 KB in size. We would have preferred a JPG version I designed with the host’s well-known face (pictured below) but it was 24 KB — over the 16 KB limit. Note that Left Talk, the title of the show / Web site / ad, was picked because it had higher value than similar terms in Google AdWords. This letterhead I designed featured the well-known face of Barry as well as a list of his famous guests in the margin. I color-corrected the blue of Barry’s name so that when printed on my ink-jet printer it matched other materials. These photo-quality business cards I designed made an impressive presentation. Making cards on my ink-jet printer allowed for flexibility, as when we shortened the name of the show’s Web site to BarryTalk.com, the domain of our e-mail addresses.